Government Telecom Company BSNL is offering one year Amazon Prime Service free. Bharat Sanchar Nigam Limited has announced a partnership with Amazon today on Monday. Its direct benefit will be to select users of postpaid and broadband of BSNL. Let's say the Amazon Prime Subsidy for one year is Rs 999. Under the new offer, a postpaid plan of Rs 399 or above and a broadband plan of 745 rupees or above will benefit from the Amazon Prime membership. BSNL is providing Amazon Prime subscription free for its users to compete with Airtel, Vodafone and Reliance Jio. With the subscription, you can watch prime video streaming such as movies, TV shows, stand-up comedy, and Amazon Prime series. Apart from shopping with Amazon, you can get unlimited free and fast delivery and access deals and offers. With this, Amazon can access the prime music and ebooks range through prime reading. The claim such as Amazon Prime Subscription OfferUpgrade to a BSNL postpaid plan of Step 1: 399 or more, or a broadband plan of 745 rupees or more.Step 2: Visit the official site of BSNL and click on Special BSNL-Amazon Offer.Step 3: Enter your BSNL number to generate OTP. After this Amazon activate the offer with the help of login credentials.Step 4: After this, download the Prime Video app in Smartphone / Smart TV / Fire TV. 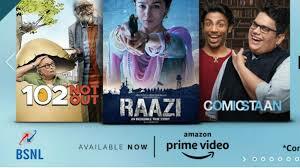 Either you can also video streaming by visiting the Amazon Prime Video site.